Following yesterday’s late night I struggled to get up for what turned out to be a very big day. Most of my companions from last night appeared in good order although Joanna took a little longer to get going..
We started today with a city tour that first took us to Istana Negara (National Palace). It was built in the last few years for $800 million dollars which shows since it is definitely grand. Luckily I got to witness a changing of the guard and got a photo standing next to him, just like in Britain they don’t move. The weather at this point was probably the hottest so far with no cloud cover. The air-conditioned van was a sanctuary for the entire day. Next up was the National Monument with shows a historical flag raising after a major battle. This was then copied by the USA at a later point in World War 2. There was a vendor selling gifts inside the monument with down plays the special place that a monument for fallen soldiers should really have. 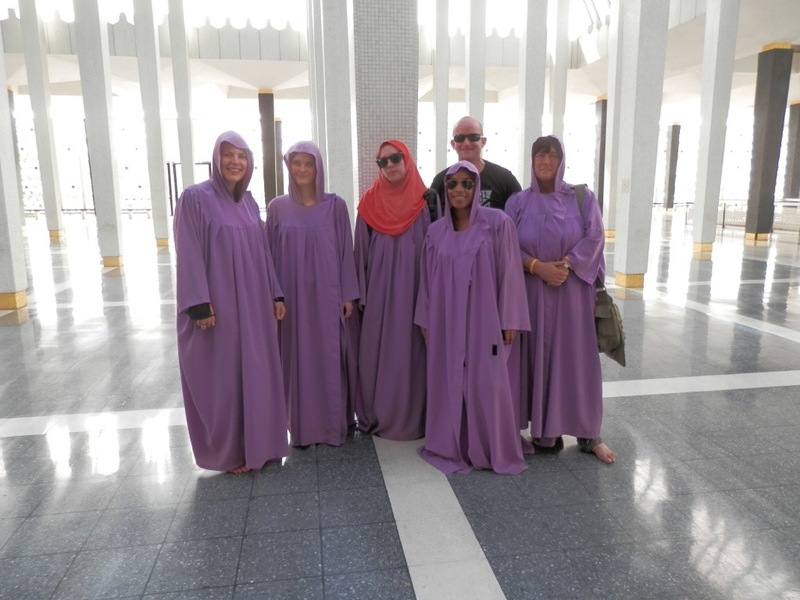 We then visited the National Mosque, the girls had to cover up in purple robes, liking like they had joined a cult. For some reason I found this funny 🙂 At this point Sarah rescued a few of us with her portable hand fans, very resourceful is Sarah. Freedom Square was the next stop. This was were the British Flag was lowered and Malaysian independence declared on 31 August 1957. The square previously house the British administration buildings and the grounds were used for the local British Cricket Club. There still stands an impressive pavilion but cricket is now long gone. Freedom Square is also the site of one of the biggest flag poles I have either seen. Going off this and the tall buildings Malaysians like big objectives! 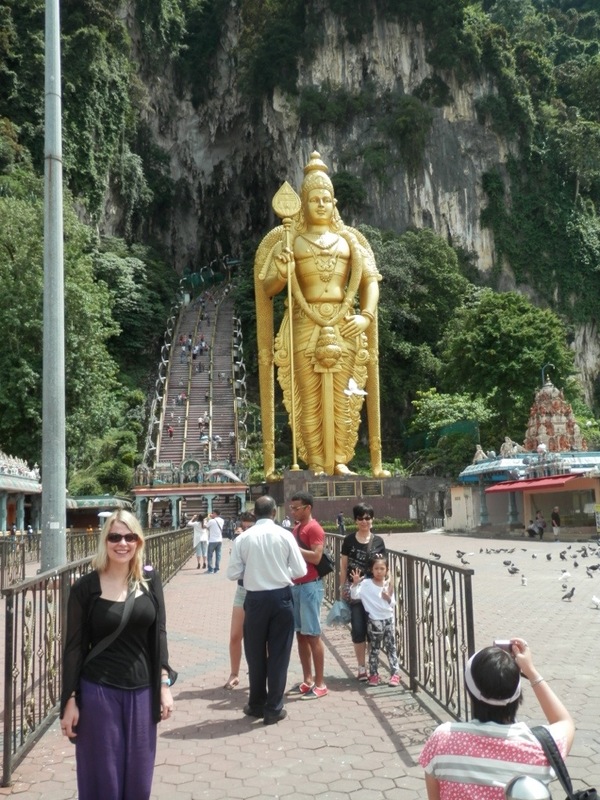 We then drove out of Kuala Lumpur to visit the Hindu Temple housed in the Batu Caves. One obstacle to a visit is the 277 stone steps you need to climb, but most of use managed this feat. The were lots of monkeys watching our (slow) ascent. The caves are magnificent and well worth the effort. After avoiding a tour of one cave which housed lots of spiders and snakes we headed back down and Sophie showed exceptional character overcoming her fear of heights, it was a big and steep drop down I can tell you. Before returning to the city we visited a pewter factory. They had some nice products but I had to say know, I have a long trip ahead and need to be careful with items to carry and money spent. Sue and Sarah however purchased nice looking necklaces. We then returned back to the hotel for some relaxation before our night tour to see the Fireflies at Kaula Selangor. The night tour once again took us out of the city, taking about 1.5 hours to get there. On the way we stopped off to interact with Silver leafed monkeys. Sarah in particular seemed to get on very well with the monkeys, including one who jumped on her shoulder. Once at Kuala Selangor we enjoyed a buffet dinner, mostly sea fish based meals since we are close to the sea. We later enjoyed a speed boat trip down the river to find fireflies. They are stunning little creatures lighting up the trees like a Christmas Tree, well worth the visit.